Home Fan Fiction Through a monsters eyes story competition - Winning Stories! 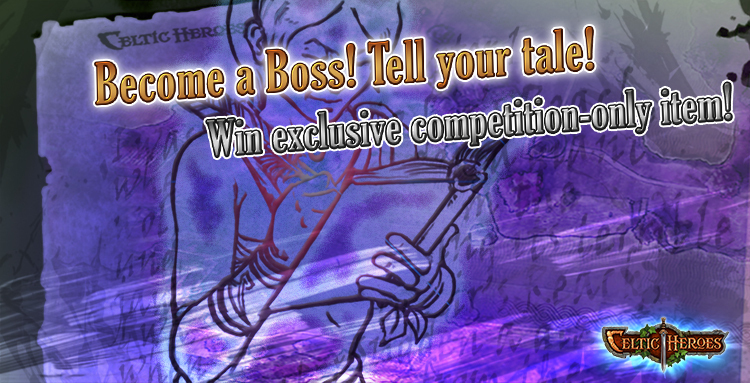 Through a monsters eyes story competition - Winning Stories! We would like to see your creativity in telling a tale from a boss perspective, be a boss and tell your story! As a Celtic Heroes boss monster, what have you witnessed and experienced? Yes, that's the word he used. He said it weakly, a slight shake to his voice, barely audible. But audible. My back turned to the boy, I stood facing over the edge. From above, where neither noise nor arrows reached, the siege on the Bridge down below looked almost.. beautiful. The few remaining Automatons fighting in full strength and splendor, the Magi performing their elegant fluid dance in response to the natural rippling flow of the magic surrounding them, streams of flames darting from their hands. If only they had decided to leave us in peace instead of instigating this terrible war. What value did death bring them? Why would they target the 'Citadel of the Magi', a peaceful academy training the finest Magi in the lands? Why not march on Crom himself? "Master, Commander Viserek told me to come find you and tell you that.. that.."
He paused, presumably to swallow. The poor boy, likely a First Year Apprentice. He probably thought I was going to incinerate him or transfer his soul into an empty Automaton at any moment. Young for a Magus; Usually Crom waited until their minds were more fully developed, but the siege on my Citadel had not waned to my favor: most all the experienced Magi had fallen, our defense reduced to sporadic attacks with little coordination. We were neither prepared nor purposed for such a sudden onslaught - My wars were fought and won centuries ago, and ever since I have engrossed myself within my work. Yet here I stood a General, despite my beliefs. I strategized and fought against the Wardens aeons ago in Crom's uprising, a trusted second in command, and as reward was gifted a tower: "I promise, all war has come to an end. You won't ever be attacked here"
Yet far below strew an antithetical reality. The battle was nearing a close, the last dancers performing their final steps before falling among hundreds. A deep resounding thud echoed through a hall nearby. They would reach here soon. He said it again, the word jolting me away from thought. "Commander Viserek says.. says.. he says the barricade in the Forbidden Halls has been breached and they are coming into the Sanctum"
Without turning, I dismissed him, my forlorn gaze once more focusing below. I enjoyed the peace, a beautiful absence of the paranoia and fear that haunted me for years, however as with all great things it's resolution was inevitable, the end too soon. In the weeks to come I know they will push forward on this final floor, through the last defenses I have in place until they ultimately reach my lair. But there they shall find me, the final guardian of this tower. And one side shall greet Death. Every great hero has their downfall, and with this, a vanquisher. For one, it's an enemy; it will come with the gleam of a sword. For another, death: its icy hand will lead them away in the safety of their sleep. For me? My fate was far worse. I was once a mighty warrior, fighting in the name of the Wardens – a prestigious group of elites battling evil for the good of Dal Riata. I was exalted, held in high regard: some even dared say I sat by the gods. Alongside my comrades, I fought in fierce battles against dragons, wizards and beasts with names of which no one dares whisper. For a time, Dal Riata was at peace. The harvest was plentiful, the winters short. The mighty gods were favouring the valiant wardens. Some say I was cursed by the jealous, others tell tales of my disrespect for the gods…so they punished me. Under the protection of the dark god Crom, an army of rebel wardens rallied in their thousands to overthrow us. Their leader, Madoc Blackstone, was the first to side with the evil deity, and plotted his betrayal. It was the morning of Beltane when we were informed of a perilous mission in a mysterious world of unknown powers. As we stepped through the swirling portal, the skies were no longer blue; the trees had lost their emerald green. The only thing to greet us were the swords, bows and daggers of Crom’s army: the Blackstone Cabal. We tried to run, but the portal was sealed shut. I can remember cloaks of black as far as the eye could see, hurling weapons at us from all directions. It was here where we fell, ready to be greeted by Death. Oh, how we wished Death would come. Our bodies are buried in the diseased Otherworld earth, our souls ripped from our mortal flesh by Crom himself, to roam for all eternity. For aeons, I’ve been waiting for him set us free at last, but the Gods imprisoned him in the fortress of Rath Parras. I have no choice but to aid in his release so I can plead for my freedom. Yet, no hero understands my struggle – they come to vanquish me, but disregarding that I am already dead. How I wish their swords could pierce my heart; to feel my warm blood; to gasp for air one last time. What of the Wardens of today? They fear entry into the Otherworld after they received news of our fate. They are weak, and a true hero must rise above them to restore their faction to its former glory. As the most prized warden of my time, I faced the harshest punishment. I was to carry the burden of a chain made from the heaviest Otherworld steel, as a symbol of my suffering. Chained for eternity to Crom and his vile world. Chained to a lifetime of pain and torture. I, I am the Chained King. But as all things must come to a end I stand here now gazing endlessly at a tree. A once blooming, beautiful, elegant tree. But over the years the tree has changed... It is now decaying tree. Just like me. I am now not a feared creature of the land. I am a now all but a joke. A underpowered creature who can be killed in a matter of seconds. Oh how I used to love being powerful, I felt worshiped, appreciated.. But not anymore. I used to relish at the fights between me and these heroes. The sound of them marching through the lands to try and conquer me. The sounds of there weapons clanging. There voices screaming in agony. But these screams soon wore out. The screams became now screams on laughter at me. For I was to underpowered for these heroes. I had my chance of fame, of power fullness but now I must reside back to my pit for a new nightmare was approaching. Gelebron himself was coming, how I wish I was him. For all I wish for now is one more chance to be feared. Fear. Something that now engulfs me in my dreams. Leaving me paranoid at the slightest noise. For I fear everyday that I will no longer be able to strike fear into heroes... Or has that day all ready fell upon me? Life is good. I AM a King after all. Thanks to my great battle leadership, my people have captured a new home. The humans call it Crookback Hollow. I accept that name. It does have a really nice ring to it. I suppose the human filth call it that because we live in a hollow network of caves that they used to call a "mine". I find that fitting, because now it is mine all mine hehehe. I've got everything a king could ever want, a throne, a warm bed, lots of great stuff that the humans left behind, and our own personal chef. We even have a jail that is run by my old pal Lockjaw. (He and I go way back.) My buddy Gristlecrunch is by my side, conjuring spells and whatnot, and our new champion warrior, Bonehead, lives here too. He was called "Bonehead" because he was just a bonehead, but since those magic rocks from the sky landed on him, he's changed a lot. Yes, life is good. I just wish those darn humans would leave us alone. They never seem to tire of coming into our domain and bothering me and my people. I guess they keep trying to take their mine back, but I wish they would realize that we are here to stay. I did make a very profitable deal with those silly Blackstone Cabal guys. They set up some of their secret meetings here and I even agreed to hide one of their top guys here. This Blackstone guy just hangs around my throne room, cowering in fear. He doesn't even lift a finger to help on those occasions when humans come looking to kill me, that lazy bum. Oh yeah, I forgot to mention that. Sometimes weak little humans come here and try to kill me. Apparently, old Maelcum Mathanach's daughter is pretty upset about the fact that I killed her father, cut his head off, and that I now use her father's skull as a mug. Honestly, I wish she'd just get over it. No matter what she tells anybody, I beat Maelcum in battle fair and square. It's not my fault that he wasn't as great a warrior as he thought he was. War is war. His skull just happens to make a really fine mug and I bring it with me everywhere. I understand how that would upset his daughter, but c'mon, she's got to move on with her life. If she wants to spend her days standing in the castle telling weak young humans to come and try to kill me, then we'll just keep cutting them down and dining on their remains. We're here to stay, even if we do literally live in Lord MacLir's back yard. (I'm sure MacLir loves that hehehe.) Well dear diary, I've got to go for now. Lockjaw captured some humans and I need to go torture them.